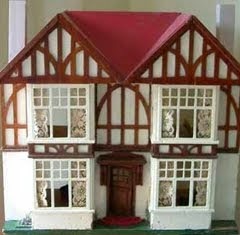 Over the past few days I have been listing quite a selection of dolls house items to various antique and vintage pages on KT Miniatures website. Some of these items have already been sold. 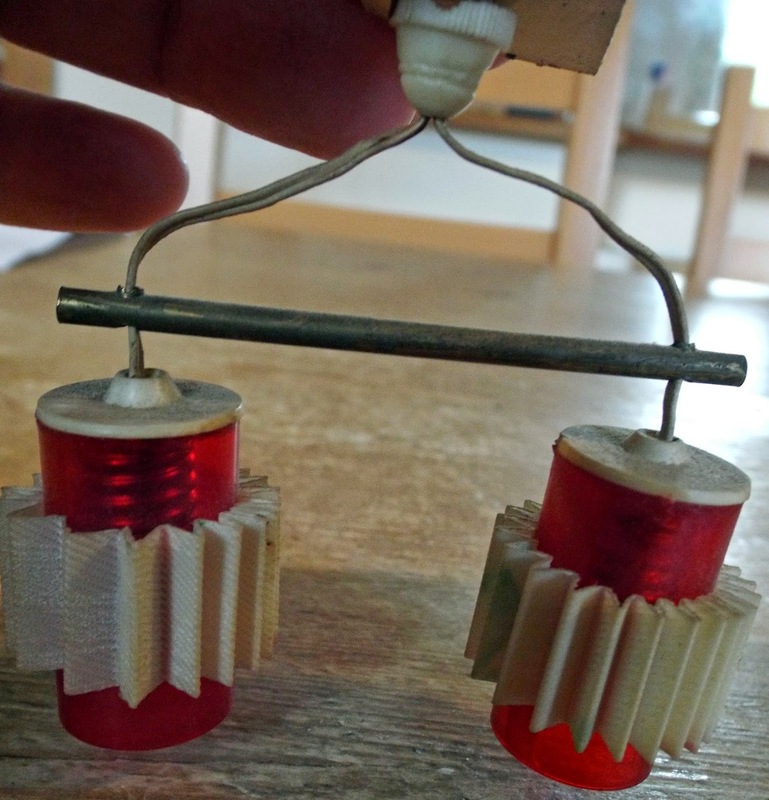 In fact, some were snapped up immediately they went up for sale....however, at the time of writing this blog posting, there are still quite a few lovely items for sale. 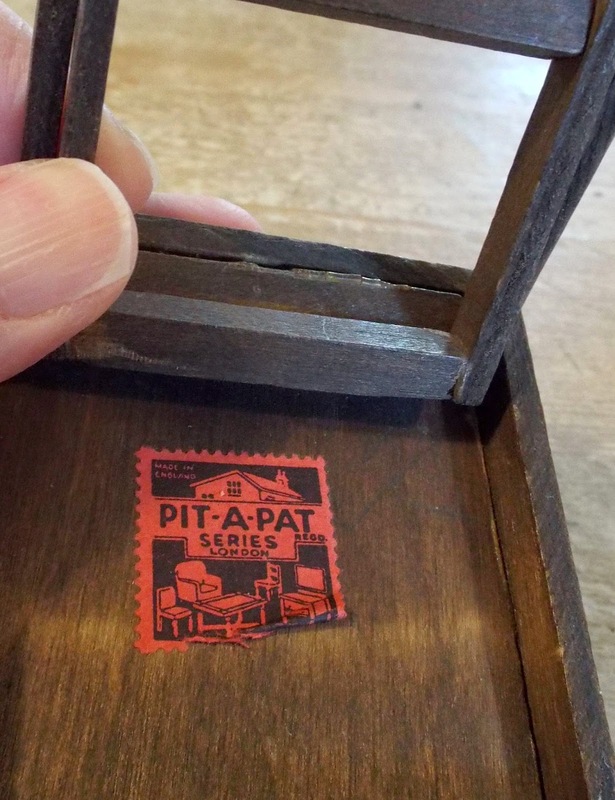 Such as this rare fold down c1930s Pit-a-Pat card table, for instance. 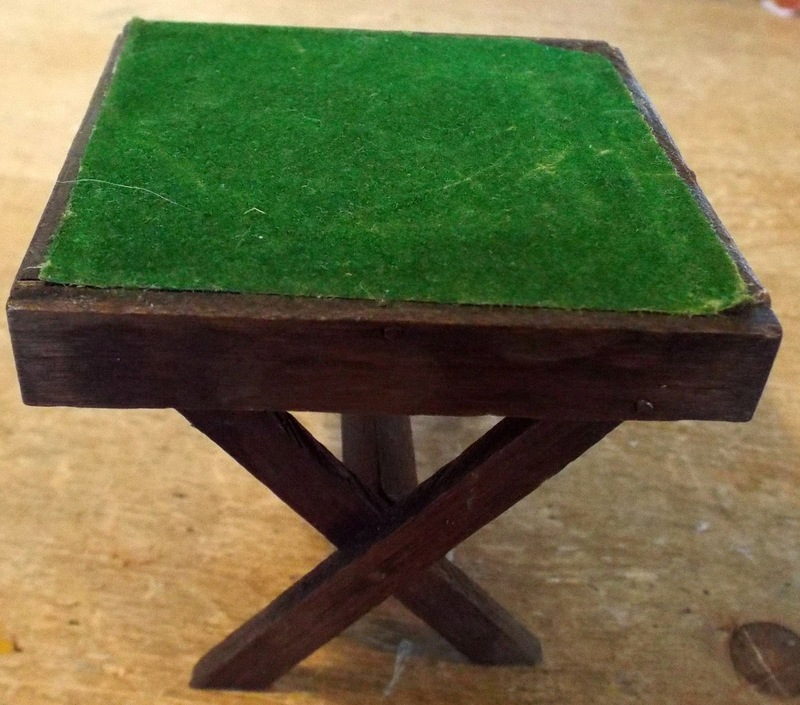 It still has the original textured green table top and the easily recognisable red Pit-a-Pat paper label underneath. 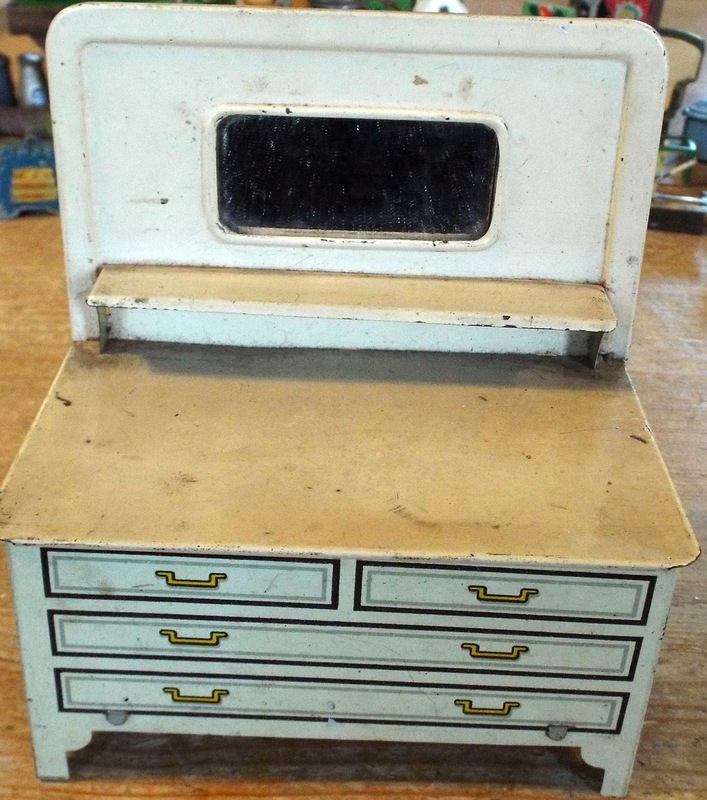 Now up for sale is this gorgeous tin c1920s/30s washstand. 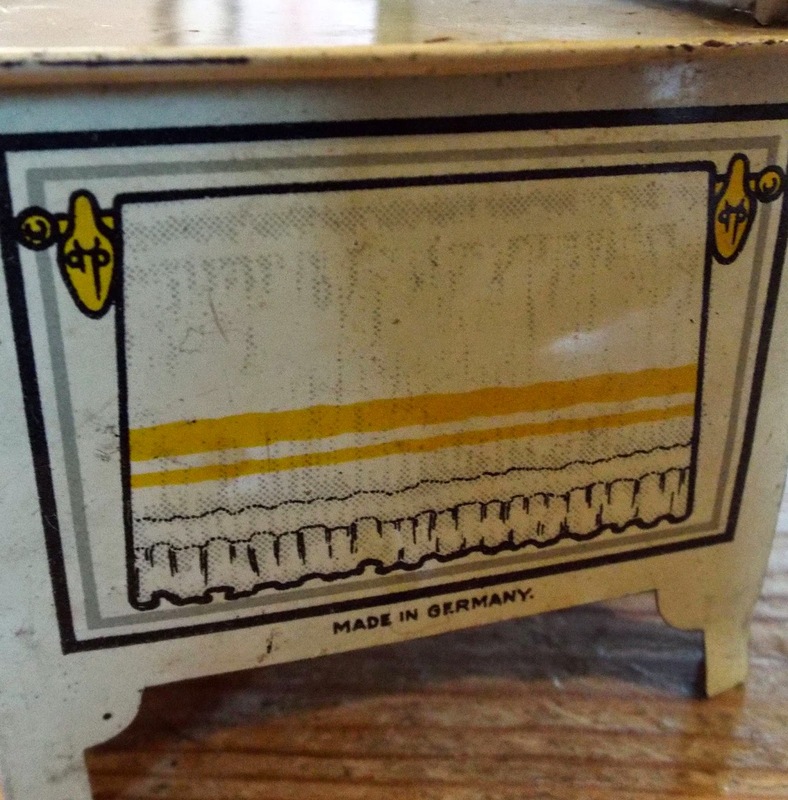 As you can see from the photo above, it is marked MADE IN GERMANY on one of the sides. What I love about this particular piece is the gorgeous lithographed images such as this towel hanging on the side rail....absolutely delightful. 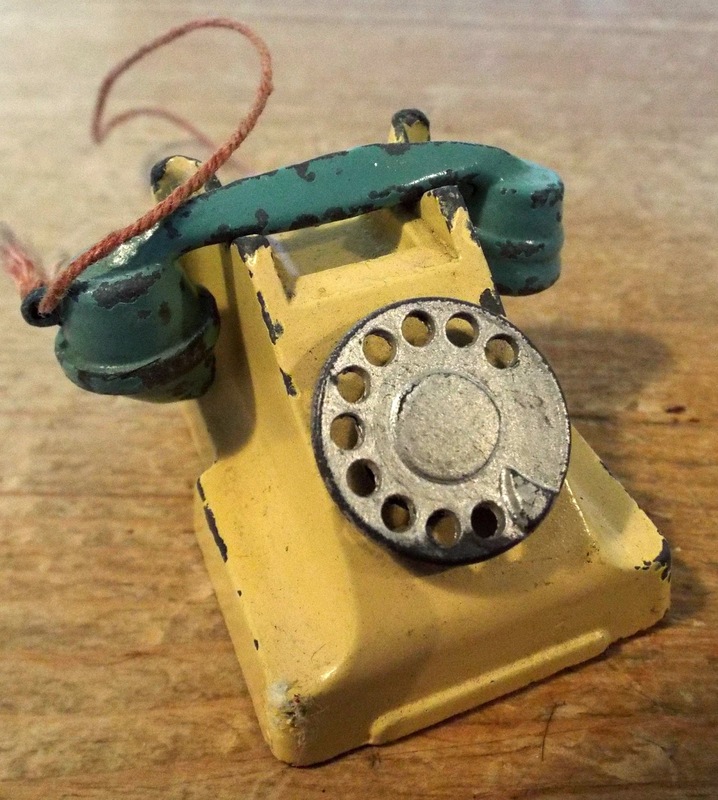 And how about something a little different....for those of you with old dolls houses may be able to find a use for this old c1930s lead Britains tree trunk. The patina of this old treasure is delightful. 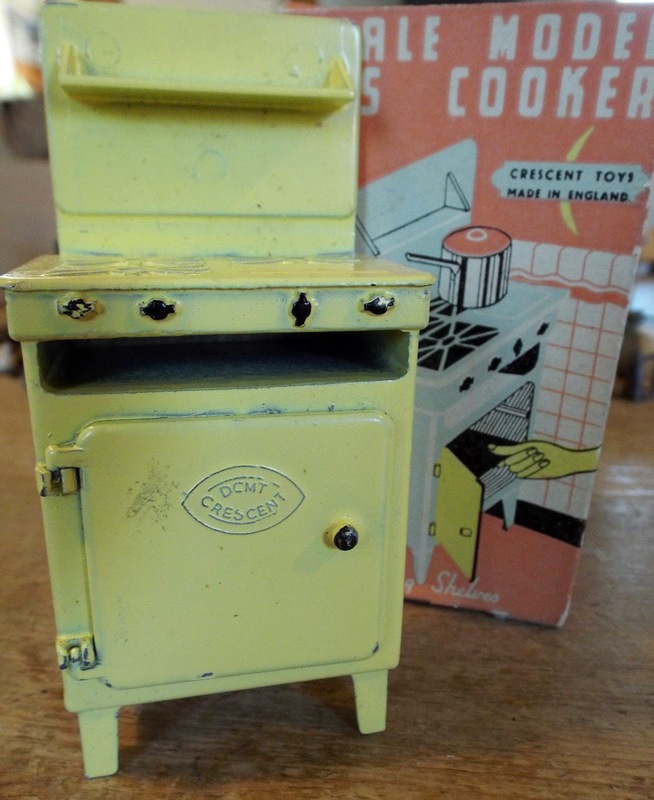 It is unusual to have the original box up for sale with a fully intact DCMT Crescent c1950s metal cooker. Is good to have both of those metal shelves there too....these are so often lost. 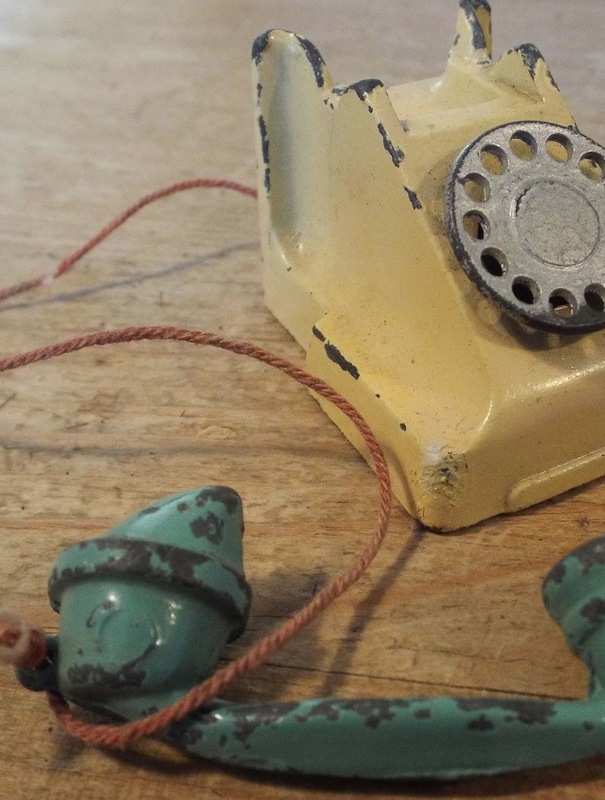 I love this slightly larger scale old metal telephone....the receiver comes off, just like a real phone. 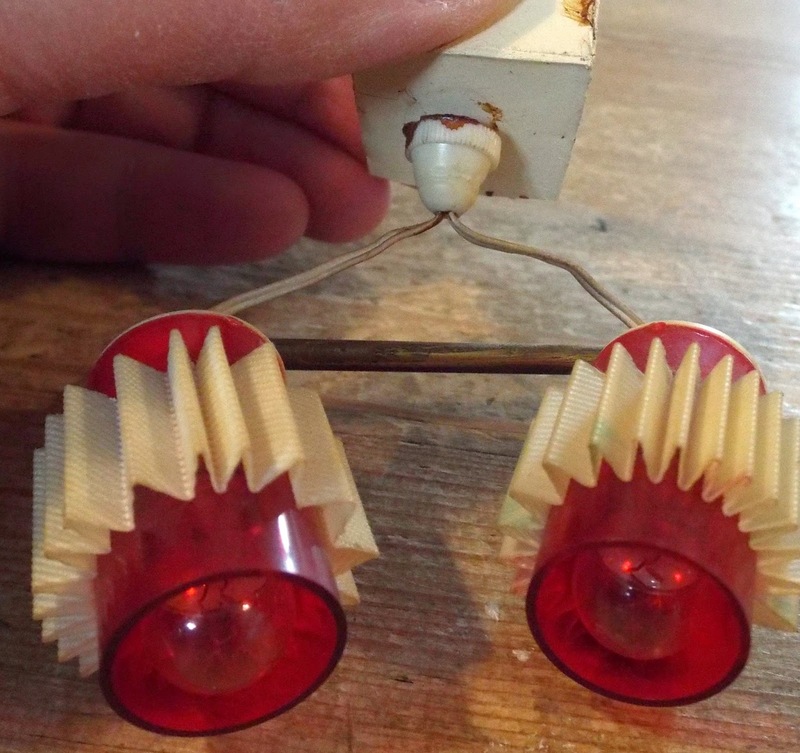 And then there is this curious vintage German light fitting with two fixed lampshades....isn't it lovely!? Not sure whether this is late c1950s or 1960s? 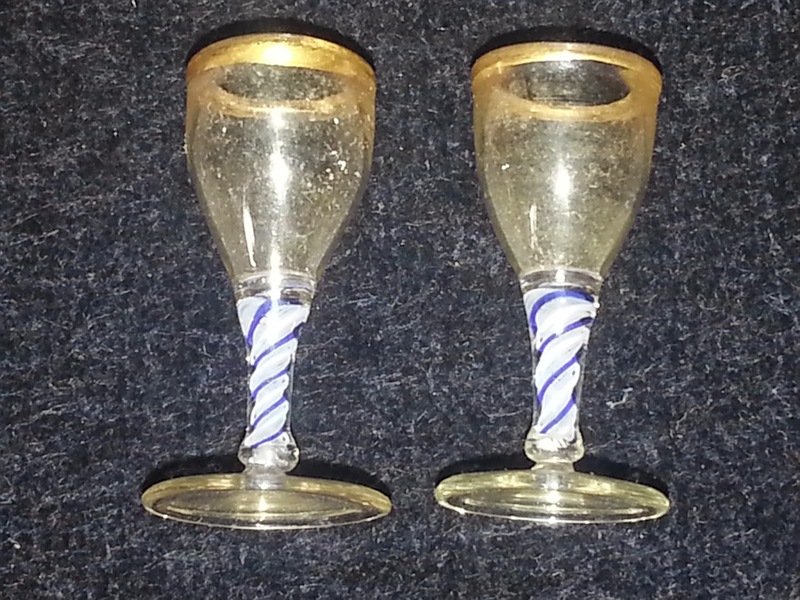 WONDERFUL RARE ANTIQUE GLASSWARE COLLECTION COMING IN! Ok....that is probably the last of the general listing of vintage items for a week or so on KT Miniatures....as I will shortly be embarking on a mammoth task of listing over 180 pieces of an entire lifetime collection of antique dolls house glassware that belonged to someone....collected over 50 years! I have promised to find a good home for every single item.....just feast your eyes on these real rare beauties!! 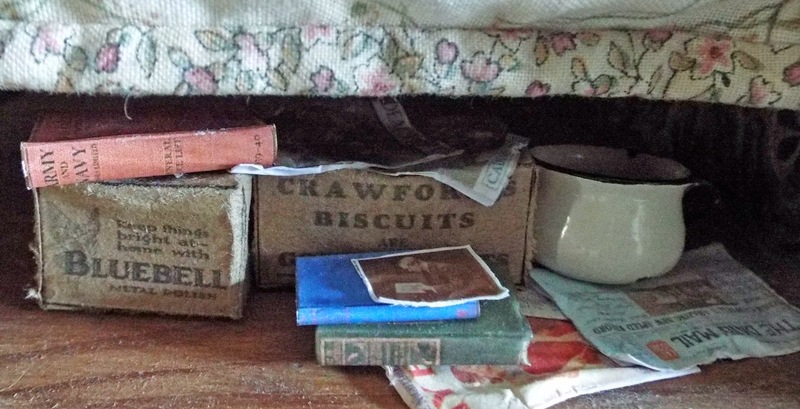 Most of the items range from Victorian to c1930s. Because of the sheer magnitude of this collection, I will be creating a whole new section on my website for these and as soon as the collection goes live, I will let you know on here. Labels: Britains Lead Garden Tree Trunk, C1920s 1930s Tin German Dolls House Washstand, c1930s Pit-a-Pat Card Table, Rare Antique Dolls House Glassware Collection. 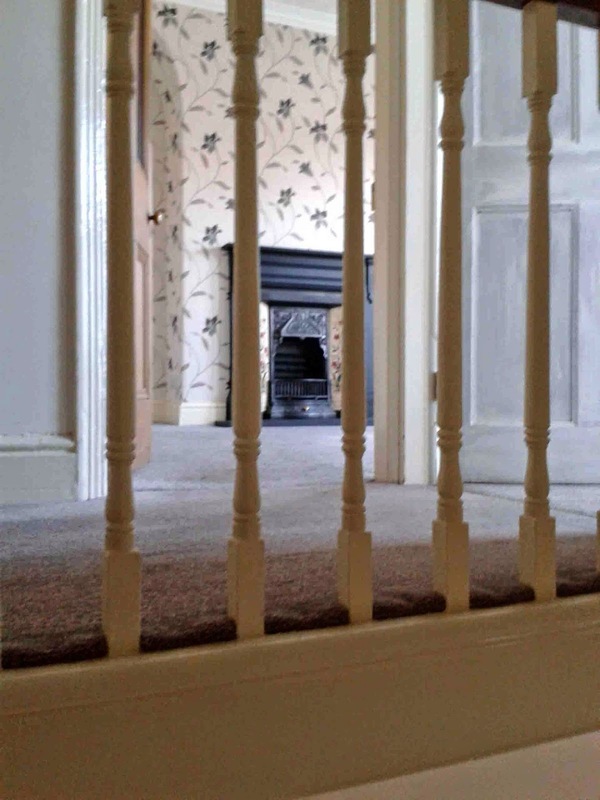 A Little Peek At A Real Life Size c1901 House....Been Up North Helping Son Move House! 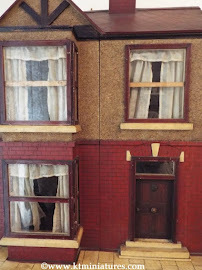 For those of you who emailed me over the past few days and did not get a reply until today, this is the reason why KT Miniatures ground to a sudden halt.....I made a dash up north to help one of my sons move into his new house. 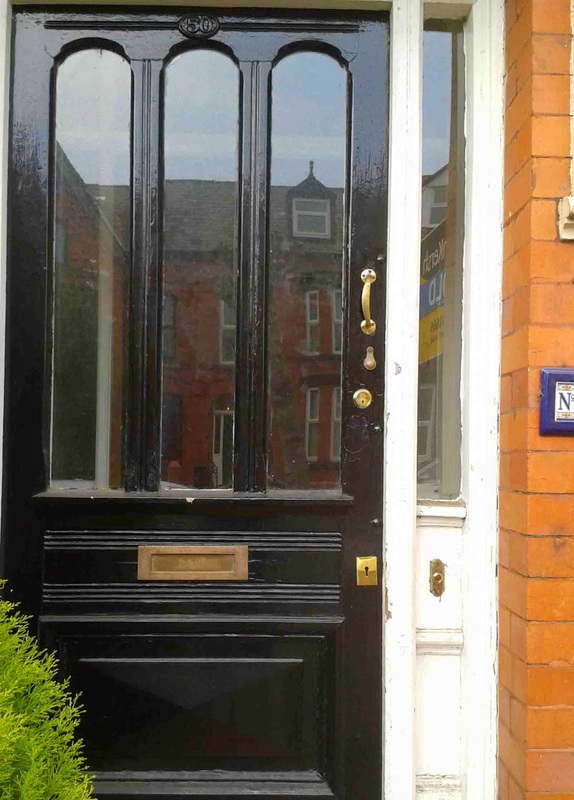 It was all last minute, finger biting stuff after a few ups and downs....but contracts were finally exchanged last Wednesday afternoon and he then moved in less than 24 hours later! I say "new" house...actually I mean his new "old house". And although it needs a lot of remedial work such as roof and damp sorted, plus nearly every room needs decorating....it is still truly stunning!!! So these past few days, I donned my old tatty clothes and have been busy cleaning (actually scrubbing as the place has been empty for a few months), hanging curtains and even putting Ikea flat pack furniture together (not recommended for the faint hearted - and I naively thought it would be easy)....but it has all been great fun! He even managed to sweet talk his sister to come across from uni' for the weekend to help too. 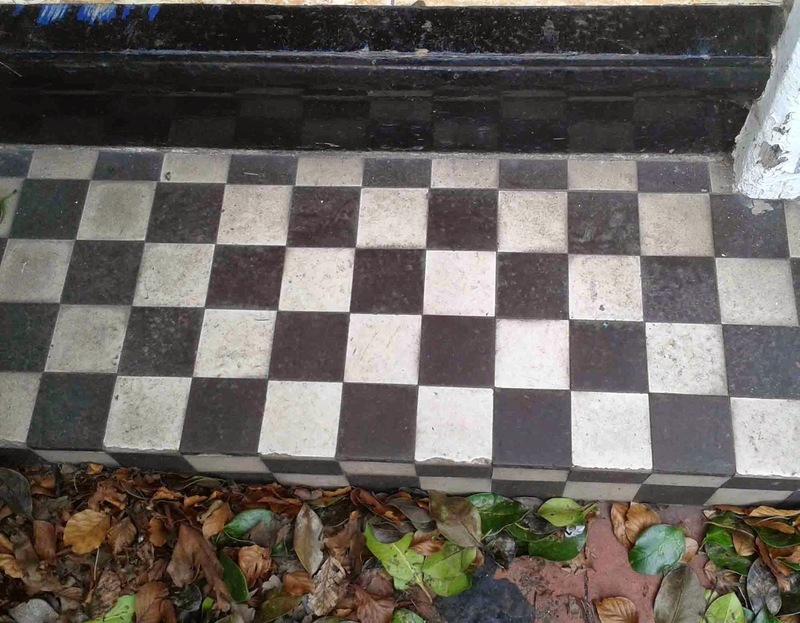 such as this tiled front door step. 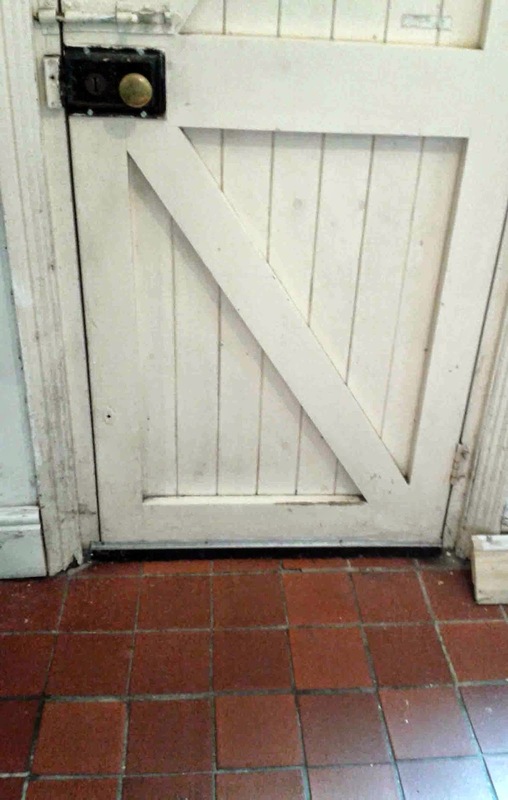 This is the original solid timber back door and quarry tiled floor, which brings back so many memories for me, as my childhood house was a c1930s lodge house and our back door, as well as our kitchen floor were just like this. The original kitchen, which is now the utility room, still has the cast iron range...not many people can say that!! (Actually...I don't even have a utility room in my own home - something I have always wanted)!! We have been fiddling with this and been trying to imagine how on earth they actually cooked meals on it for all the family. The chimney is blocked off so it can't be lit but there is still very dusty coal sitting in the bottom. 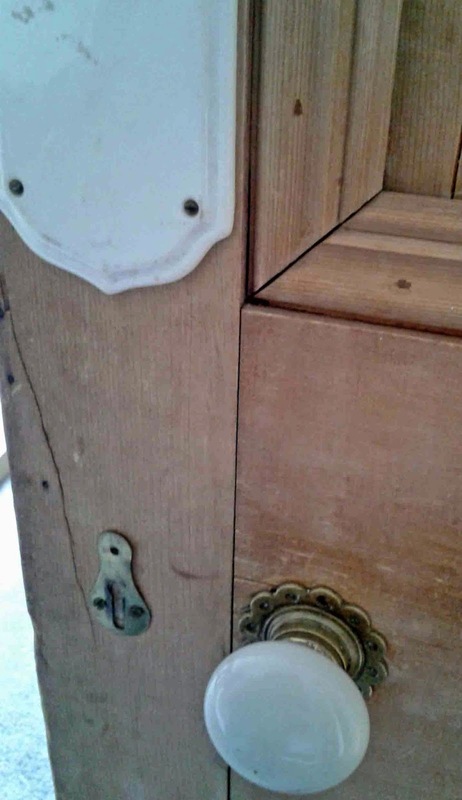 There are a few of the original pine doors with old ceramic and brass handles and doorplates....arn't they just fabulous!? This was sitting in the back of a local fireplace specialist's workshop!! And yep, this will shortly be going into his dining room to replace the one that a previous owner had ripped out. 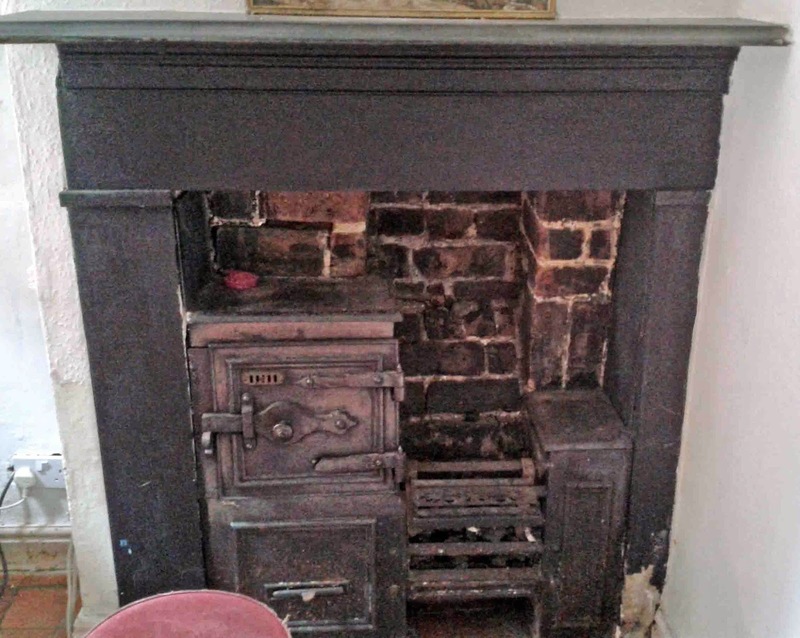 The specialist chap is going to clean it up and add a grate and hearth....then will put it in situ. I never thought I could get so excited about someone else's home....but I can't wait to see it in place. Although these past few days have been hard work and am totally exhausted, it has been absolutely fabulous. Sigh.....and now I have returned home, have worked through my backlog of emails/orders/enquiries.....so I think I can say that life is back to normal. 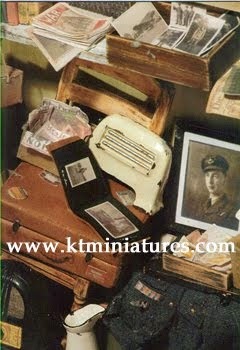 I shall shortly resume listing more vintage items to KT Miniatures website throughout the week. PS. As window curtains still need taking up and after the builders have left, there will be much more cleaning to do, guess who has volunteered her services? Can't wait for my next visit!! 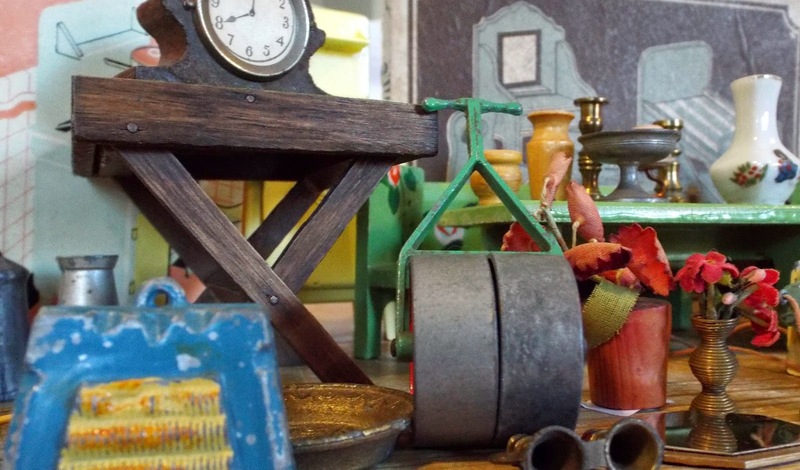 KT Miniatures Is Taking Part In The Dolls House & Miniature Scene Magazine Birthday Giveaway! If you turn to pages 10 -11 of the new issue of Dolls House & Miniature Scene Magazine, you will find some donated miniature goodies from key contributors, artisans, publishers and supporters of the magazine in celebration of their 250th issue! 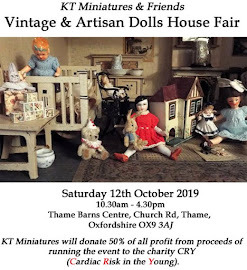 Amongst the donated prizes, you will see a donation by KT Miniatures of an "Under The Bed Set" consisting of a 1/12th scale vintage style set piece designed specifically to fit under a dolls house bed but it would also look quite at home in a dusty corner of an old attic. 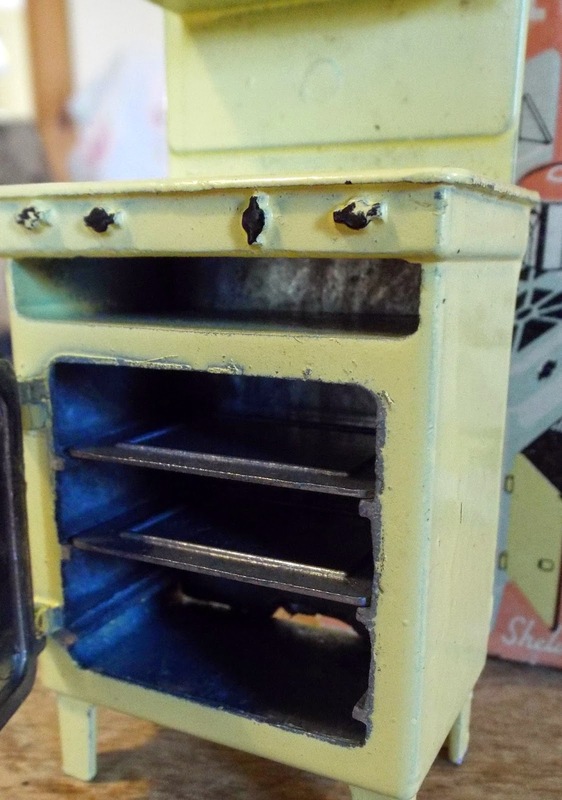 It can be used in both vintage or modern reproduction dolls houses, and consists of a couple of printed old boxes, old books, magazines, newspaper, aged enamel potty, etc. All items are fixed. To enter the competition, and have a chance to win this or any of the other lovely donated prizes, all you need to do is to get yourself a copy of the Dolls House & Miniature Scene Magazine - March 2015/ Issue No. 250 and turn to pages 10 -11. Take a look at all the lovely items on offer, then send a stamped addressed envelope, stating which prize or prizes you would like to win. Closing date is 26th March....so you have a couple of weeks or so to find a copy. Labels: Dolls House And Miniature Scene Magazine 250th Birthday Issue Free Giveaway, KT Miniatures Prize.